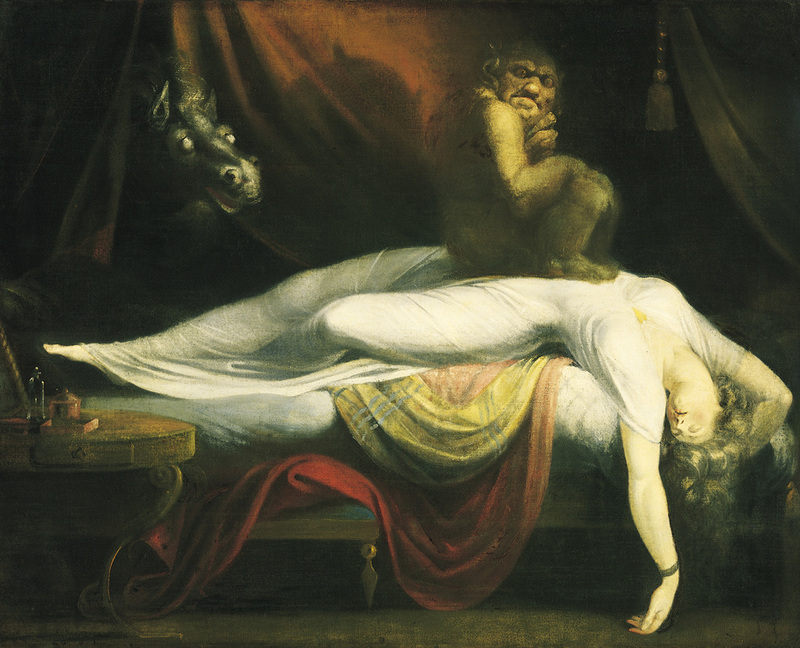 John Henry Fuseli's "The Nightmare"
For Jung there was an older, wiser part of the psyche, the Self, which desired both the well-being of the ego and the establishment of a dialectic relationship between the ego and the unconscious. It is in the context of this dialogue that one’s true personality is hammered out through the process Jung referred to as individuation. Dreams offer singular and therapeutic perspectives initiated by the unconscious. They are designed to maintain a psychological balance in the moment while also beckoning us forward into a meaningful life. When we lose sight of or stray from realizing our true personality, the Guiding Self will often resort to nightmares to redirect our attention - the more nightmarish the dream, the more urgent the call. Nightmares attend to those wounds we carry that are in need of healing, help us address the fears and anxieties life so often brings, and call us to focus on issues blocking us from living a creative and meaningful life. Friday evening's presentation begins our exploration of nightmares by examining the personal and psychological context out of which nightmares arise; namely, the self-regulatory nature of the psyche and the ongoing process of individuation. We will address briefly the history of the nightmare as expressed in art, then the phenomenon of the nightmare as experienced in film. A majority of our time will be devoted to looking at various dreams which are nightmarish in quality, with an eye toward trying to understand both their urgent message and their timely meaning. Saturday's workshop will continue the exploration of nightmares looking at specific situations, motifs, figures, objects and animals that are often cited as being frightening. Because a strong intensity of feeling is always present in the experience of a nightmare, we will examine what central role such feelings play. Although we will have an opportunity to reflect on various nightmares taken from clinical situations, group members are invited to bring and share their own nightmares to be explored in a safe and gentle manner. It will be our intention not only to gain some understanding of the nightmares we have had, but also to give each participant some tools they can use to better understand nightmares yet to come.